The Vikings started slow, but weathered the storm to knock off the Detroit Lions on the road. Daniel House recaps the win and discusses how this impacts the team moving forward. The Vikings started slow, but weathered the storm to knock off the Detroit Lions on the road. In the process, they managed to pick up their first road win the NFC North since 2012. These types of wins are necessary for this team to get over the hump as they try to make the playoffs. After surrendering 14 points over the first 12 minutes, both the offense and defense started to settle down. The Vikings outscored Detroit 23-3 over the final moments of the game and would slowly put them away. However, they couldn't place that final dagger again. Nonetheless, Teddy Bridgewater nearly had a career-high passing game and Stefon Diggs corralled over 100 yards for the second consecutive game. Not to mention, the defensive line notched a whopping seven sacks and beat Matthew Stafford up. The offense might have settled for five field goals, but it was enough to pick up a much-needed divisional win over the Lions, 28-19. Mike Zimmer preached all week about the importance of getting off to a quick start. The Vikings certainly didn't do this as they allowed 14 points over the first 12 minutes. However, after the first quarter, the defense allowed just four yards until the midway point of the 4th quarter. The pass rush started to increase and the Vikings were constantly dialing up packages for pressure. Lions quarterback Matthew Stafford was sacked seven times and was clearly battling injuries late in the game. Early in this contest, Stafford had time, but once the blitz packages were applied, the total tide of this game shifted. The offense still had some issues scoring in the red zone, but managed to gain some more offensive identity as this game progressed. They were more balanced and passed the ball 35 times, while running on the ground for 34 snaps. This was one of the first games where Teddy Bridgewater and Adrian Peterson complemented themselves better. Peterson didn't run the ball particularly well, but his 75-yard run was one of the highlight moments of the game. Finally, this team showed a great deal of resiliency as they bounced back from a tough start on the road. Teddy Bridgewater nearly matched his career-high for passing yards, completing 25 of his 35 throws for 316 yards, and two touchdowns. He didn't make any mistakes and took care of the ball very well. Bridgewater may have held onto the ball too long during a few sacks, but he certainly waited until the final moment to make some tough throws. More importantly, he found 11 different wide receivers in the process. The Vikings offense was very balanced and the distribution was good. The only problem was scoring in the red zone again. Blair Walsh kicked five field goals and many additional points were left on the field. Nonetheless, they moved the ball well and managed to put points on the board on every possession but three. Moving forward it will be important to score touchdowns in those situations. 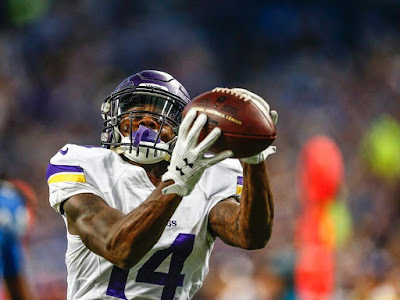 Stefon Diggs had another fantastic day, hauling in a phenomenal 37-yard diving touchdown catch. The rookie had over 100 yards receiving and continues to be a reliable target in the offense. As for Jarius Wright, he had two critical drops in key situations, but they didn't prove costly. The Lions had four sacks and the pocket was still very messy for most of the game. Teddy Bridgewater held the ball too long on two of those occasions, but the offensive line still wasn't getting it done. Until a 75-yard run, Adrian Peterson had just 14 yards on 11 carries. The lanes still weren't big and Bridgewater was pressured too often. The Vikings offensive line is still a major weakness and will continually hurt them against superior opponents if they can't start to win the battles at the line of scrimmage. Nonetheless, their performance today was good enough to knock off the Lions. Early in the game, the Vikings weren't bringing many rushers. As the second quarter approached, Mike Zimmer started dialing up some heavy blitz packages. It proved to be way too much for the Lions offensive line to handle. The Vikings defensive front combined for seven sacks, which was a career-high for Matthew Stafford. Eric Kendricks had two sacks, coming in untouched for one of them. Harrison Smith, Chad Greenway, and Everson Griffen did more of the same and the Lions had no answer for any of the free rushing the Vikings were deploying. When the Minnesota defensive line can dominate like they did today, they'll be very tough to handle. The Vikings secondary didn't perform their best today, but still did enough to win. Andrew Sendejo took some poor angles and missed some assignments. Xavier Rhodes was a little grabby as he was called for pass interference and holding on three occasions. However, after a slow start, the defensive unit started to come together to tame the Lions' early offensive outburst. Being able to adapt is very critical as a defense in this league and the Vikings did just that. A reoccurring theme for the Vikings has been their inability to shut down inferior opponents late in the game. The final score doesn't do a good job of indicating how well the Vikings played in the later stages of this contest. However, they settled for field goals on five occasions, three of which were short range tries as drives stalled. The Vikings will eventually start to play teams who are better than these lower tier teams and they'll need to start punching the ball in the end zone. Field goals won't be enough against those teams and touchdowns will be necessary if this team wants compete for a playoff spot in a jam-packed NFC. Sure a performance like today's will work against a team like the Lions, but won't be enough later in the season. Irregardless, you have to love the fight this team has. If the Vikings can knock off the Bears next week, they'll be 5-2 for the first time since 2007 and would be 3-0 in the NFC North. Both of those feats would be excellent accomplishments for this squad.